The Popular Struggle Coordination Committee (PSCC), on Monday evening, lit up an olive tree that was uprooted by the Israeli occupation in Bir Ouna valleys, Beit Jala town, Bethlehem.The tree was decorated with both oppression and resistance tools, according to the PNN; It was adorned with bullets, teargas canisters, wires, walls, and also had the Palestinian Kufiyyeh, slingshots, and photos of Palestinian children killed or imprisoned by occupation authorities. Photos included child detainee Ahmad Manasrah (13) who was shot and tortured by Israeli settlers in Jerusalem, under the stabbing pretext, and Ahmad Dawabsha (4), the only survivor of the Dawabsha family, who were burned alive by Israeli settlers. 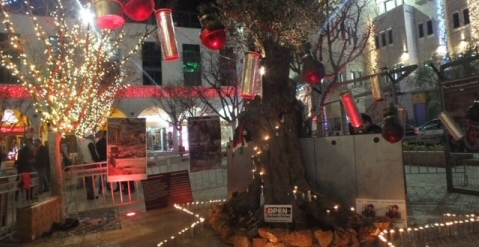 The tree was surrounded by messages calling for an end to the Israeli occupation and lit with candles for the souls of more than 120 victims killed in only three months. Inside the tree, PSCC planted another young tree as a representation of Palestinian hope and resilience, life emerging from the womb of death. For her part, Lama Nazeeh from PSCC said that Bethlehem (the famed birthplace of Jesus and the world center of the Christmas tradition) is supposed to be the land of peace but, unfortunately, it’s full of pain and blood. Secretary General of the Palestine National Initiative (Mubadara) movement, Mustafa Barghouthi, said that Jesus was the first Palestinian to suffer here, and now all Palestinians are carrying on his journey. “We will always remain here, praying and working for the peace that we deserve, and work together to keep the bells ringing.